The Board of Dentistry are the facilitator of the said exam, they are Dr. Rannier F. Reyes, Chairman; Dr. Gloria M. Bumanlag, Dr. Steve Mark G. Gan, Dr. Melinda L. Garcia and Dr. Dominador H. Santos Jr., Members. The results are usually released in three (3) working days after the last day of examinations. But expect the official results today, May 14, 2015. 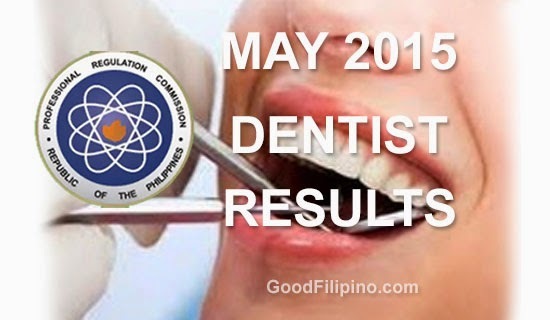 You can also view here the List of Passers of May 2015 Dentist Board Exam. For more information about the Dentist Results (May 2015) - list of passers, please kindly share to your joined social networking sites. Comments or suggestions about "FULL LIST: Dentist Board Exam Results List of Passers (May 2015)" is important to us, you may share it by using the comment box below.